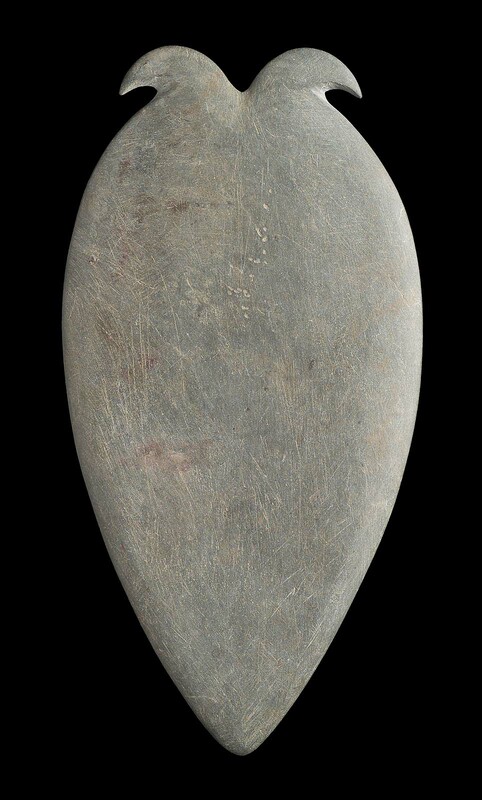 Shield-shaped (scutiform) palette of gray stone. Top carved with double (highly stylized) bird head motif. Surface has slight pitting, perhaps from use. Stone palettes are identified particularly with earlier periods of ancient Egyptian history. Non-functional (in the utilitarian sense), often elaborately decorated “ceremonial” examples are known. Often simpler, functional examples were used to grind and mix mineral-based pigments (including ocher, malachite, hematite) that were often mixed with other substances to make cosmetics or other decorative media.